In 2009, I wrote a blog post arguing that the Israel Defense Forces (IDF) had “fallen off the social media bandwagon”. Their digital media campaign in support of Operation Cast Lead in Gaza was hastily conceived, unimaginative and anti-‘social’. Nearly four years later, the IDF’s social media strategy is much more sophisticated, offering online audiences regular and engaging updates on the progress of Israel’s military activities in Gaza – Operation Pillar of Defense. As I noted at the time, this bland ‘press statement’ delivered by Capt. Benjamin Rutland takes place in a washed out ‘non-place’ with the Israeli flag propped up against the wall. Not exactly engaging content. Now the IDF Twitter feed is being written in plain English. What’s more, the IDF is using hashtags (#IsraelUnderFire), encouraging Twitter users to retweet their content and creating imagery that the IDF believe will be circulated by online communities. In 2009, Noah Shachtman revealed in Wired just how ad hoc the planning for the social media element of the information war had been during Operation Cast Lead, describing the IDF’s YouTube campaign as “off-the-cuff” – a last-minute idea by a group of “twenty-something” soldiers. Shortly after Operation Cast Lead, the IDF’s Twitter fell silent for 179 days and only began updating again in August 2009. In December, Haaretz reported that a new media unit would be set up to engage online audiences on Facebook, YouTube and Twitter. 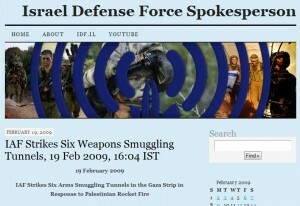 A ‘behind-the-scenes’ TV report demonstrated how the online presence of IDF Spokesperson was updated by a fully operational “New Media desk” by 2011. The 2012 online media campaign for Operation Pillar of Defense is undoubtedly a significant ‘improvement’ in Israel’s attempt to communicate their version of the conflict using social media tools. But challenges remain. Some updates are probably designed to be picked up by journalists – announcing the onset of the airstrikes via Twitter rather than in a news conference was an interesting departure, but hardly surprising given the widespread adoption of Twitter by journalists at media organisations. The IDF’s Twitter feed is also trying to leverage an active online community which is supportive of Israel’s goals by producing content which can be disseminated online through retweets on Twitter and sharing on social networks. Other content, such as the YouTube explainers, can be seen as an attempt to convince sceptics of Israel’s military operation. One IDF tweet issued a warning to Hamas operatives and as Stuart Hughes pointed out on the BBC’s College of Journalism blog the IDF’s Twitter account has attracted the attention of Hamas’ military wing, the Al-Qassam Brigades. Communicating messages successfully to different audiences in the same space is problematic, particularly when the ‘audience’ can write back. Critics have argued that the IDF’s Twitter feed is a distasteful addition to an immoral military campaign. The Now Lebanon blog, for example, headlined a post with the title: ‘IDF cheerily live-tweets infanticide‘. And the unanswered question is this: what difference, if any, will the IDF’s more coherent approach to social media make? It is perhaps too soon to make a judgement, but the IDF’s social media campaign in support of Operation Pillar of Defense might prove to be a template for future information operations online as militaries attempt to influence a more fiercely contested informational battlespace. In 2010, Lt. Gen. W. Caldwell, Dennis Murphy and Anton Menning published an article in the Australia Army Journal in which they suggested that the US military could learn from the IDF’s use of social media.